There are several ways to reach the formation page in goalunited. The main way is to use the menu bar at the bottom of the screen. By clicking on the day and time info of the match announcement at the top of the screen you get straight to the formation of that match. And pushing the playfield button next to one of the scheduled matches in all fixtures also leads here. If you want to manage the formation for a specific match other than the next one you will have to choose it using the fixtures table. The other two ways always lead to the formation management of the next match. In the first line the opponents and the time will be shown — it might be good to have a look at this, too. You should create a good standard formation, it will automatically be set when you miss to set an individual formation. Always keep it up-to-date. The formation for a match has to be saved at least 60 minutes before kick-off. Take a look at your opponents, adjusting your tactics and formation to the oppenents strengths and weaknesses can make a big difference. You can save a half-time direction card right into the formation. You can change or remove a card up until 50 minutes after kick-off. Make sure to remember to set the tactics and special jobs for every match. All relevant data about your players is displayed in compact view on the left hand side with further information of one selected player below it. Double clicking will open the details panel as usual. Players in the starting eleven are highlighted green, substitutes are marked grey. Via Drag and Drop the players can be moved from the list onto the playfield or the bench. To remove a player from the starting eleven he must be dragged back to the list. Players with nearly similar skill values on one specific position should be distinguished by their current energy, form and endurance. Further criteria are the player’s height, special talents, the stronger foot and the character. Players that are blocked because of a red card (or three yellow cards) can also not play. Changes need to be saved by clicking the check mark in the lower right corner! The field is subdivided into 9 sectors which are numbered the same way as the numpad on the keyboard. When a player is dragged over the playfield the sector division will show up. The most suitable sectors are highlighted in green. The bar on top of the player will show you how suitable the exact location on the field is for the player. The goal keeper's sector (number 0) is a special case and consists of only one position. Each sector has one main position, and several sub positions. The Main position is the central position of the sector. In the 6 wing sectors, the main position is the middle outside position; In the 3 center sectors the main position is the exactly middle. The sketch shows two players on the main positions of the sector. When a player is not set onto a main position he is standing on a so-called subposition. By standing on a subposition a player can be put nearer to the adjacent quadrants and individually influence the ongoings in that sector. Careful: If you place a player on a subposition, he might need a different skill to influence the neighboring sector effectively. For example: If you place your central striker on a defensive subposition, his playmaking skill will become more relevant (the most important skill for sector 5), scoring will have less relevance in exchange. If he is placed more to the left or the right side the wingplay skill will have more influence. Pay attention to the bar on top of the player and needed skills for the neighboring sectors. For the defensive and offensive sectors you also have the opportunity to place your players in an extra offensive or defensive position by placing him directly on the base line. Players always have the most effect on the sector they play in, and a small effect on the rest of the field. When a player is playing on a subposition, he effects the neighboring sector(s) more, but in return he does not effect his one sector as much anymore. A player that is placed right on the baseline will not have any effect on the rest of the field anymore and all his energy will go to his own sector. Currently there only will be substitutions when a player is injured and has to leave the pitch. In this case the bench player for this position will automatically take over the injured player's position. If this specific position on the bench is free another bench player will be chosen. You need to assign 4 special jobs to the players on the field: Captain, corner kicks, free kicks and penalty kicks. To assign the job to a specific players, simply click on the symbol on the bottom and then on the player to assign it to. Check the special jobs page for more information on who is suitable for each job. If you have 8 or more different personalities in your starting match line up, you will receive 10% performance bonus for the whole line up. You can see the bonus in your player ratings in the newspaper. The effort level decides how much energy your players will put into the match. Some matches are just for fun, others are hard fights. Most matches will probably be league matches. There are five levels to control and influence the effort and the playing strength of the players. The higher the level the more engaged the players will act on the pitch. The higher the effort, the more energy is used by your players — And of course, the higher the effort, the harder you players will play, raising the chances for cards and injuries. The players need a specific minimal energy to play at each effort level. If a player's energy is low, he will mainly suffer from the negative effects of a higher effort level (like higher risk of injuries and yellow cards, higher loss of energy). The positive effects will only be there with high enough energy. When setting the effort level you should take into consideration the importance of the match. In friendly matches for example low effort should be chosen. The loss of energy as well as the gain of experience and endurance will be depenent on the time the player has been on the pitch.. If a player doesn't play a complete match — because of a red card or an injury — or if overtime is played the values will be calculated proportionate. It is generally recommended to control the engagement level with care! Read more about energy in the energy answer! In the first couple of weeks after founding a new club it is the best choice not to set a tactic. With that no sector will have a bonus or malus. Later on this choice can also be made if the trained tactics are thought to have more disadvantages than advantages. Choosing the right tactic is one of the more complicated chapters of goalunited. There are different approaches about what is the right tactic to play at what time and against which opponent. One way is to try to win the opponents' weak areas by strengthening those sectors in your own formation, the opposing tactic is to strengthen those areas that the other team is particularly strong in. In any case it is a good idea to check on the last matches of your opposing team to see what his tactics are and where his strengthes and weaknesses are. Over time you will have a quite good feeling for choosing the right formation and tactics when playing against specific kinds of opponents. The formation overview does not show how much better a single player will be playing in a specific sector but how the sector strength will be influenced. In the visualisation the effects are shown in different colors and in percentages (0% means normal values). The higher the sector strength the higher the probability of winning this sector against your opponent and the more your players will try to lay emphasize on playing within this sector. 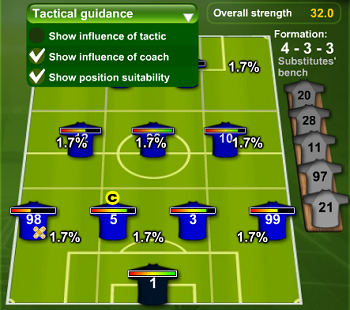 So you should choose a tactic that will fit to your formation to get the highest effects. After the match you can read in the Newspapers how good a job your players did in that match and each sector. You should try to win as many quadrants as possible to enhance your chances of winning the match. At the same time you should try to lose as few (better none) quadrants clearly against your opponent. All quadrants have nearly the same importance on the match although the corner quadrants' effect is slightly less. One of these two ways of marking your opponent's players must be selected before every match. Both will only have advantages and there is no malus. The more defensive variant enforcing the defense quadrants (1-3) by 7.5%. This variant allows a better playmaking and enforces your midfield quadrants (4-6) by 5%. With the offside trap your players will try to let the opponent get caught in an offide position. A successful offside trap will end the attack instantly, if it fails though, it creates highly dangerous situations. Only use if well trained. Those three visualizations will help making decisions easier when creating a formation. You can also see the overall strength of the team on the field at the top right. The strength values of the players on the field are summed up. 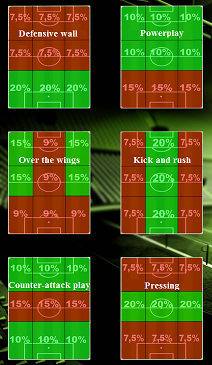 By ticking this mark you can switch on a visualisation of the tactic's influence on the team strength. This shows the influence of the coach. Depending on the philosophy of the coach he will give bonuses to different sectors. If you uncheck the position suitability you remove the bar above the player to see how well he will play on each position. Up to four different formations can be saved as presets to easily recall them later. With this the formation does not have to be made from scratch every time. To save a preset the formation must be set completely (11 players, tactics, and special jobs). Then click on the pencil button, select one the four possible presets in the dialog and enter a name for the preset. Save by clicking 'yes'. Important: The 'Standard' preset is very important. This formation is automatically chosen when no other formation is set. The name of this preset can't be edited. To load a preset just click on the button (if there is already a preset assigned to that button). As a premium feature the formations of the last five matches can be opened by clicking on the bottom right list button. Of course the loaded formation can be adjusted at will. Always keep your standard formation up-to-date! Make sure you check the standard formation from time to time. When you sell players or buy better ones, other other things in your team change, it might have to be adjusted.